New Zealander, Richmal Oates-Whitehead, died alone in her London flat, just weeks after the events in London on 7th July 2005. As a clinical editor for BMJ Evidence, Richmal was working in the BMA building in Tavistock Square when the number 30 Bus explosion occurred. "She later told the Weekend Herald, a New Zealand paper, that she had been helping the injured in a makeshift hospital set up in a hotel next door to the BMA when two fire-fighters approached her for help. "They needed one doctor to assist as firemen cut two badly injured people out of the wreckage. Would she come? They would understand if she declined," the front page article said. It reported Ms Oates-Whitehead as saying: "There was no room for hesitation - I wasn't thinking at that level. It was the moral and ethical thing to do." Her account included a controlled detonation of a second bomb. "Outside, there was another enormous bang as police detonated the 'bomb' - which turned out to be a false alarm." The problem was twofold. Police had no record of a controlled explosion in Tavistock Square; moreover she was not a doctor. Her name does not appear on either the UK or New Zealand medical council registers." As at the Edgware Road site, why was this controlled explosion carried out and how did it affect the collection of evidence, forensic or otherwise? 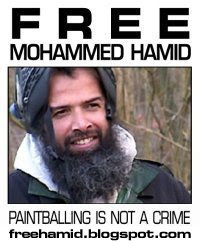 Why did Scotland Yard deny Richmal's account, which was patently true? If the police have no record of a controlled explosion on the bus, who conducted the controlled explosion? How did the controlled explosion on the bus impact the collection of evidence from the scene? "There was only one bus that was involved. The other explosions around buses were controlled explosions by our explosives officers. So there were three attacks on tubes and one on a bus". Another controlled explosion which has since come to light via FOI requests, led to the evacuation of Holborn police station, central to these sites, at 10am on the morning of July 7th. Where did these other controlled explosions take place? What was subjected to controlled explosions? What prompted the conducting of these explosions and what purpose did they serve? Did these other explosions in any way hamper the emergency service response? "A police officer then approached me and requested I assist with evacuating the wounded from the bus as there may be another bomb. The urgency was such that these people had to be moved regardless of injury. I approached the bus from the rear nearside. There appeared to be a big gap, then just seats. The entire back of the bus had gone. I could see organ and body parts on the footway. I remember seeing clearly a whole liver and what I believed to be four right arms.I stood on the bottom deck of the bus entering from the middle doors. I could see a male on the left-hand side of the bus in a seat. DC Perry has shown me a diagram of the bus and I have placed a letter D where I believe his location was." My Lady, could we have on the screen [INQ8952-2]? My Lady, just pausing in the statement for a moment, you will see that this is a plan of the upper deck of the bus. Notwithstanding that, the D that you'll see there would appear to be consistent with the position of Sam Ly or certainly insofar as it was on the nearside of the bus. As you will recall from the other plan, he was, in fact, sitting several seats further to the rear of the lower deck of the bus. LADY JUSTICE HALLETT: Sorry, just a minute. MR ANDREW O'CONNOR: Perhaps we could have the other plan? LADY JUSTICE HALLETT: Is this consistent? There's obviously a question mark as to how much reliance I can place on any of this, but: "I stood on the bottom deck, having entered from the middle doors. I could see a male on the left-hand side." That, if she's come in the middle doors and on the left-hand side, is either likely to be looking down the bus towards the rear at the offside or it's on the left-hand side and going towards the driver. I'm not sure that it is consistent with Mr Ly, is it? LADY JUSTICE HALLETT: Leaving aside she's got the wrong deck. MR ANDREW O'CONNOR: The deck is wrong, that's the first point, although, as we've seen from the photographs, by this time, certainly towards the rear, the top and bottom deck had collapsed into each other. If one looks at the position D, what one can say is that it is on the correct side of the bus to be Sam Ly. It is two or three seats too far forward. In fact, it's three seats too far forward to be Sam Ly, but it is on the correct side of the bus and it is next to the window. As far as the left side of the bus, my Lady, from where she entered the bus, as you say, it would have been on the right. He was sitting on the left-hand side of the bus as one looked in the direction of travel. LADY JUSTICE HALLETT: But this plan, because it's the upper deck, has no middle doors. MR ANDREW O'CONNOR: No, my Lady. LADY JUSTICE HALLETT: I don't feel I can place any reliance upon that observation at all. My Lady, she then goes on to describe what she was wearing as: "One black jacket, a pink top, purple skirt and a pair of red shoes and a green stethoscope. I wore all of these items when treating people from the bus." She then gives a little further information which is not relevant for present purposes. Q. As you say, you were taken into the courtyard of the BMA building. Q. We've heard evidence about how all the casualties on the road, including you, were taken there. You were treated by paramedics and the BMA doctors for a while? Q. ... Was it while you were in the courtyard at around this time that you met up again with Richmal Oates-Whitehead? Q. Did you have a conversation with her? A. Yes. I mean, in the courtyard at that time there were relatively few people that I actually knew, so -- Richmal being one of them, so we did talk during that morning, yes. Q. You'd been separated from her for how long at that point? A. I would guess 30, 35 minutes. Q. Did she tell you about what she had been doing for that time that you'd been apart? A. What she said was that she had gone into the County Hotel, which is the hotel next to BMA House, that she'd been asked -- she'd been asked to see some people, she'd seen a gentleman, a man who had an enucleated eye, she said, and then somebody had approached her and asked if she would go on to the bus to help there, and that -- but that it could be dangerous, there could be a second device, and all she told me was that she'd been on the bus and that it was pretty terrible, and that's the only detail that I can remember that she said. Q. You said that she told you that someone had approached her. Did she tell you who it was? A. Sorry, a police officer. Q. I think that, at around the time you met her, you were involved in assisting a different patient, a female patient? A. She did. I think that we were both -- I think this was back in the Hastings room. I think it started to rain and people had been moved back into the Hastings room and, whilst we were in the Hastings room, there was this young woman who broadly fits the description. All I remember of her was that she had some blood in her eye, I think in the anterior chamber of her eye, but possibly around the conjunctiva, and I remember Richmal saying, "I'm worried about her because her abdomen is swelling and she may have a ruptured spleen, we should get her urgent medical attention", and I think that we then -- or she then contacted a -- somebody in a high visibility jacket, possibly, possibly, with "Doctor" on the back and arranged an evacuation -- an early evacuation of that woman. Richmal's untimely death on 17th August 2005, within a week or so of the start of an investigation by the BMJ into her medical qualifications, was deemed to have resulted from natural causes, and on this basis no Inquest was held. The cause of death was given as Pulmonary embolism and Bilateral calf deep vein thrombosis. A tad strange perhaps, given that Richmal had collated information on pulmonary embolisms as part of her medical work for the Cochrane Institute (as cited in this Parliamentary paper) and would likely have been aware of possible warning signs before the condition became fatal. Richard Jones who gave many media interviews in which he gave utterly false accounts of witnessing the 'suicide bomber' on the 30 bus was never subjected to the gross media character assassination meted out to Richmal and had his testimony to the Inquests treated with some respect. Richmal was certainly correct about the second controlled explosion on the 30 bus - although there is confusion from witness testimony with regard to whether one or two controlled explosions were conducted. By the time the Tavistock Square evidence ended we were no clearer on the matter. Precisely why Scotland Yard denied Richmal's account of a controlled explosion remains a mystery. 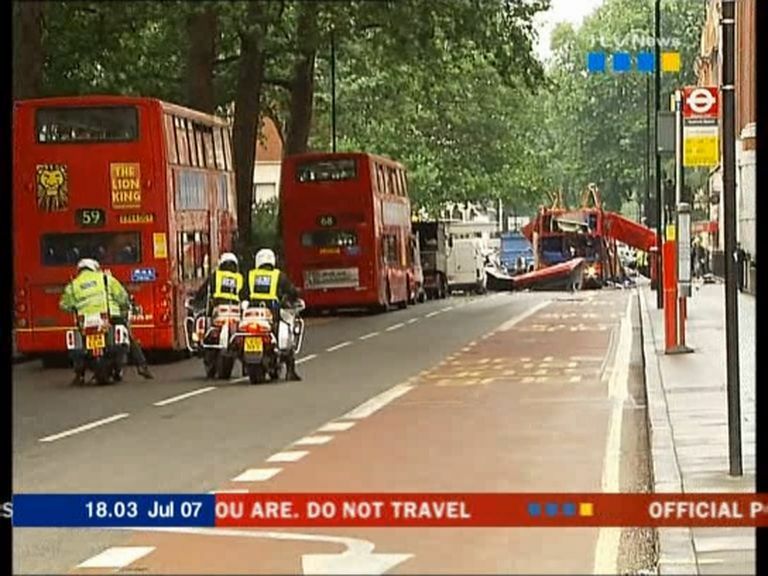 BBC News report of a controlled explosion at Tavistock Square from J7 Truth Campaign on Vimeo. An interesting fact that emerged is that an EXPO officer was withdrawn from Tavistock Square and sent to Holborn police station, resulting in the evacuation of Holborn police station and a controlled explosion at 10.00 that morning, as mentioned in our submission to the Inquest. This appears doubly strange as another EXPO officer, Richard Travers, who had carried out a search of the train at Aldgate for secondary devices also claims to have been tasked to this incident before returning to Aldgate. [03/11/2010 p48:5] Holborn police station was central to three of the affected sites that morning. One street away, Graham Morley was standing outside, Theobald's, a butchers he runs on Theobald's Road opposite Holborn police station which responded first to the explosions at Russell Square. "It's hard to put it into words really, it's hard to think who would have done this. I thought all of these things were over, you know?" Mr Morley first heard about the explosions on Taverstock Square when two police bomb disposal teams pulled up outside his shop and ambulances started pouring up Lambs Conduit Street. He had just sent out his deliveries for the morning. "Before I knew it they started to cordon this all off," he said. "They told us to evacuate but we had an 82-year-old woman in here. She said 'I've seen it all, I'm not going anywhere.' So we stayed with her." "It's chaos really," he said. Q. -- and performed a search? Q. It was some time after that that other explosives officers arrived and carried out a controlled explosion? A. It was the sniffer dog officer who informed me that, on his experience and from his information, the bus was not considered as safe, and at that stage, I -- you know, I had been close enough to be aware of the fact that there were people -- who they were I don't know, but attending injured parties on the bus, and that officer said, in view of the fact that this is not safe, you know, we should withdraw. By the time I stepped away, I had already seen two casualties being removed from the bus. Q. You say you didn't go into the courtyard, but I take it you were aware that there were casualties in the courtyard and that they were being treated? A. Yes, clearly I was aware of the fact that casualties had been taken into there, and obviously knowing what the building was, you know, believed that that was a safe place for them to be, and I was also made aware of the fact that there were a number of people being cared for within the hotel next door as well. Q. Yes. Some time after your arrival -- in fact, we think the time was about 10.40 or thereabouts, so getting on for an hour after the explosion -- there was a controlled explosion, as I've mentioned. Were you aware that that was going to happen before it did take place? A. I was aware -- well, as you see from the statement, the sequence of events was that I was aware that an explosives officer had been deployed and then actually withdrew quickly because he was then deployed to Holborn police station where there was a suspect package. But then I was met by Mr Clarke, and I don't actually recall him saying that he was going to conduct a controlled explosion and whether it was him or somebody else informed me that that was going to take place. But then, as my statement explains, he then came to give me a bit more of a briefing as to what was on the bus and what he found. Q. Before the controlled explosion took place or after? A. No, I think I mention that it was after. A. You have to forgive me because, if that information had been given to me, obviously it's not reflected in my statement, but it may well have been logged by my loggist and I don't have access to my log. Q. Sure. One of the things it's easy to forget in our position, with hindsight, is that there was, of course, a possibility that there was another device on the bus,and that, when the controlled explosion took place, there would have been a very large explosion. That was a real possibility at the time, wasn't it? A. Sorry, can you just say that -- run that again? Q. The controlled explosion, the purpose of it, was to detonate a device or -- I'm sorry, an object, as to which there were suspicions that it might be another bomb. A. -- and they were treating that as suspicious. Q. -- around it, it was, of course, possible that it would have been a much larger explosion if there had been an explosive device on the bus at the time? Q. It follows from that that before a controlled explosion like that is conducted, it is, of course, necessary to make sure that there was no one in the vicinity who could be injured? Q. Also -- isn't this right -- it's important to inform other emergency services of what is taking place so that they understand and don't react in the wrong way to hearing that explosion? A. Yes, that would be the case, yes. With my dog, I began to search the bus. We found a microwave oven box on the parcel package area close to the driver's cab. My dog showed no indication of another device. I opened the box and I could see a microwave inside. I did not open the microwave itself. "During my inspection of the bus, I was aware of many screams for help. After the search, I tied my dog to a nearby lamp post and went back to the bus to help the casualties. I enlisted the help of two London Fire Brigade officers, I believe they were from the Soho fire station. With the two firemen, we began to help the injured people on the bus. I pointed out to the two firemen that I could not guarantee their safety. I was unaware if there was another device on board. Bus explosion aftermath from J7 Truth Campaign on Vimeo. Inspector Ellis of the London Fire Brigade was responsible for extracting the remaining survivors from the bus and claims in this report that, "Secondary devices were suspected later in the incident and controlled explosions carried out. I had informed LFF Drew that this was about to happen and ensured crew safety at all times". Ellis was not questioned on this when he gave his witness testimony on 24 January. No pronouncements of life extinct were carried out on the bus, and a HEMS doctor [Tim Harris 28/01/11] was prevented from going onto the bus by police at the cordons who feared a secondary device and the senior London Ambulance Service officer [Williamson 28/01/11], who arrived after and in response to, the second controlled explosion, was also prevented from approaching the bus to check the scene by police who claimed the area 'still wasn't safe'. The number of controlled explosions becomes no clearer, as evinced by Justice Hallett's comment at the end of the read statement from EXPO officer Clarke, the explosives officer who carried out a controlled explosion on the microwave. He was presumably not the first explosives officer at the scene as that officer left to attend to a suspect package at Holborn police station, as Supt. Summers testified. It's a statement dated 6 August 2010. Statement of MR JONATHAN CLARKE read Martin Ferguson from the 7 July Inquest team attended my offices to take a statement. I am an explosives officer with the Metropolitan Police and have over 30 years' experience in ammunition and explosives. This statement refers to my deployment and subsequent actions taken on 7 July 2005. This statement is in addition to two statements I have previously made." "I was tasked to Woburn Place WC1 along with my colleague PC Kubanski. I arrived on scene at 10.24 hours. I initially reported to a member of the traffic police who briefed me as to what had happened." "Also on scene were a number of emergency personnel from the Metropolitan Police, London Ambulance Service, London Fire Brigade, as well as members of the public and persons I later learnt to be from the BMA. The scene was chaotic on arrival. My main concern was the preservation of life, securing and preserving the scene and public safety of persons such as the LAS and BMA personnel who were assisting with triage on the injured persons, on receiving information about a possible secondary device. My main priority was to move people away from it. I established there were no critical or injured persons left within the cordon area. The dead bodies had been covered up. Critically injured persons had been moved away from the scene and other injured parties taken to hospital. "I approached the bus and entered it through the front doors. On the nearside parcel shelf as I walked in there was a large cardboard box with wires coming out of the top. There were a number of emergency personnel on scene. I cleared the area and established a cordon. I carried out normal EOD actions (Explosive Ordnance Disposal). The item was made safe and found to be false, it was a microwave oven. I subsequently examined all left luggage around the bus and on the bus to establish if there were any other hazards. After the controlled explosion, I made an assessment of the bomb damage on the bus. I then reported to the Incident Commander and handed the scene over to DC Chris Davidson." My Lady, there is also a document from this witness. I wonder if we could, for completeness, very briefly look at it? It is [INQ10245-3]. My Lady you'll see an explosives officers call-out form. The top right-hand corner we see it's dated 7 July 2005. My Lady, you will see that the time apparently of the call-out was 09.49, so approximately two minutes after the explosion. You will recall various evidence we've heard about the police officers who were on scene that quickly being concerned about an explosive device. It would appear that the call for explosives officers was made at 9.49 and, my Lady, I think perhaps, if we just look over the page, the next page [INQ10245-4], simply for the sake of clarification, you'll see the damage caused. The microwave in the suspect package was destroyed, so it is clear that that was, as it were, the focus of the controlled explosion. LADY JUSTICE HALLETT: Thank you very much. The fact that Mr Clarke faces danger or possible danger on a regular basis, in my view, his courage should not go unremarked. There was one witness, Mr O'Connor, who thought they heard two explosions. That was a mistake, was it? MR ANDREW O'CONNOR: My Lady, it may be that we have further evidence about that. Certainly I think -- it may be that there was evidence that there was a late, perhaps much later explosion, but the evidence we've heard is clear, that this particular explosion was at 10.43. LADY JUSTICE HALLETT: That's the impression I'd had. MR ANDREW O'CONNOR: There was only, I think, one explosion at that time. Q. -- after the time of the bomb. You described being concerned about the microwave, the box, the microwave oven. Did you understand from Inspector Dermody that the sniffer dogs had already checked the bus and checked the microwave oven? A. The sniffer dogs checked it after I had arrived and after Mr Dermody had handed it over. A. I called for the standard explosives officer response to a suspect device. I presume they would have either attended on their own initiative or responded to that, but they were there a few minutes after I'd called for EXPO for the microwave box. MR ANDREW O'CONNOR: Mr Perry, before lunch, I was asking you questions about the microwave oven. Q. You were describing your concerns about it, and you had said that you had made a radio call asking for some assistance in dealing with it. Perhaps we could look at document [INQ10121-1]. Mr Perry, this is the CAD that we were looking at earlier. If we look at the entry for it, it would seem exactly 10.00. There again we see your call sign. It's another one of those messages of which only part seems to have been recorded, but again, the message is fairly clear. Is that the call that you made about the microwave oven and asking for EXPO, that is explosives officers, to attend? A. Explosives officers, yes, ma'am. Q. On your understanding, was it as a result of that call -- you're not sure of the mechanics of it, but probably as a result of that call that the two officers with sniffer dogs attended? A. I couldn't honestly tell you why they attended. I was very grateful that they did. A. But they work on a different working channel to me. So I can only assume that they picked up that there had been this incident on their working channel on the radio. It wouldn't have been directly as to what I was saying, so it would either be assigned through a control room because of this CAD or they would have picked up on it on another channel. Q. But it was shortly after you sent that message that they arrived? A. A very few minutes, yes. Q. -- and declared it, as far as they could, not to be a risk. You heard what Mr Dermody said to the effect that, although it provided some level of comfort that the sniffer dogs hadn't picked anything up, you couldn't assume that there was no problem at all. A. Exactly so. There are some explosives, I believe, that have very limited odours and some that the dogs just aren't trained in, and I believe home-made explosives are one of the ones that dogs aren't trained in. But that's -- I couldn't -- you'd have to ask someone from the explosives side about that. Sniffer dogs had indicated that the microwave box was safe, but Perry, who admits to no expertise in explosives, posited the idea that he believed these could be 'home-made explosives'. We can only wonder on what basis Perry might have thought this. Q. I want to ask you about the casualties that you saw in a moment, but, before I do, I take it that your concern about secondary explosions and the danger of that was still present at this time? Q. Had it been increased by anything that you saw on the bus when you had gone on at that moment? A. There was a period after that that did increase my awareness of a secondary -- the possibility of a secondary device, which was a microwave. Q. Yes, the microwave oven. Was that something that you saw when you first went on to the bus or was it something that you became aware of later? A. It was something I became aware of later. Q. Well then, we'll return to it in due course. Were you doing anything at this point about secondary explosions; for example, trying to contact or obtain sniffer dogs or anything of that nature? Q. What was your reaction to seeing it? A. I didn't -- I wasn't comfortable with that item on the bus, I was quite -- bearing in mind my initial concerns about secondary devices, it gave me a more heightened sense that it possibly might be something that I need to deal with. Q. What did you do to deal with it? A. There was two ex-employee search dogs on the scene for the Metropolitan Police and I ushered them over and briefed them as to what I wanted done, simply to clear the bus and that particular box. Q. As you say, they'd been on the scene. That's why I asked you earlier whether you'd called for them in any way? A. No, I didn't call for them, they were on the scene. Q. They simply appeared, did they? Q. Did you ever find out if they'd been summoned or whether they simply arrived by good chance? A. I never found out. A. They swept the bus with the two dogs and then I asked them to sweep the cordons. Q. How long did that process take? A. Not very long, a matter of minutes, I guess. Q. The result was negative, they indicated that they hadn't found any trace of any further explosives? "I've just had at Tavistock on the bus, I've just had EXPO round with dogs ..."
That's the sniffer dogs, is it? Q. Yes. Could we look, perhaps, at one more document, please -- almost finished -- [BTP154-74]? So here we have a call timed at 10.22, so some time later. Q. Do we take it, then, that when Inspector Perry arrived and took over the role of Silver Commander, you didn't leave, you stayed there for some time? A. I stayed there for some time after, yes. A. Probably less than that, I would imagine. "Just a quick sit rep from Tavistock Square. Most of the people have been removed off the bus. The dead and dying have been removed into [that's presumably the British Medical Association] building." You then say this: "There's a briefcase on the bus which EXPO are going to check out and then the scene should be fairly clear." This is something different from the microwave oven, is it? Q. What do you remember about the briefcase? A. I believe when the gentleman I referred to earlier with the olive skin and the dark hair was removed off the bus there was a black briefcase or attache case on the top of the bus which was a concern, again, in a similar fashion to the microwave oven. Q. Would that not already have been checked by the sniffer dogs when they went on earlier, or could you not be sure of that? A. The dogs wouldn't have gone up to the top deck, because it was a mangled wreckage and it would have been very dangerous to go up there and run the dogs round it, so they would have cleared the bus from the ground level, I believe. Q. I see. Now, it may be that we can ask others about this, but when you say that EXPO are going to check it out, do you know what happened? Did they, in fact, try to get the sniffer dogs to check that briefcase out or was a different means of securing that danger adopted? A. Before I left the scene, myself and another BTP colleague had a brief conversation with an explosives officer from the Metropolitan Police and my colleague was -- had some expertise in BTP in dealing with sort of suspicious items, and we had a quick conversation and, from what I've been told, there was a controlled explosion on that item after I'd left the scene. Q. We'll hear a little more about that in due course, but your understanding before you left was that that was something that was being considered to deal with this second issue? Q. We've heard some evidence already in the last day or so about what was understood to be a risk of a secondary device in a briefcase on the bus and the fact that a controlled explosion was undertaken in response to that risk. We see here two messages that you sent, which appear to be one sent just before the controlled explosion and one just after, which enables us to identify quite closely the time at which it took place as being at about 10.43. Is that an accurate assessment of what these two messages are? A. That is correct, my Lady, yes. Basically, at that time the EXPO officer coming to the courtyard had said there was going to be a controlled explosion. I put that up on to the radio to make officers aware in the immediate vicinity that there was going to be another loud bang and then there was. Q. In fact, if we look two entries down at 10.47, so a few minutes later, there's one further message from you indicating in substance what you have just described, the fact that there was one deceased in the courtyard and another in the basement. Was that around the time that you then went down to the basement to investigate the other body in the way that you've described? 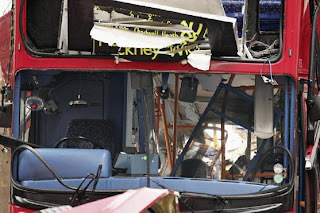 LADY JUSTICE HALLETT: Do I take it that the controlled explosion would not have taken place until all the living survivors had been removed from the bus? A. I would like to think so, my Lady. Looking at my statement, being that it was made shortly after and, obviously, due to traumatic events, my mind wasn't -- I think, if I recall my statement, it seems to be that we were still moving casualties out, but I'm sure we moved all casualties and then the controlled explosion took place. I then spoke to [another police officer] who identified himself as an EXPO officer. He said that he was happy that there were no secondary devices on or around the bus. My main concern now was to free the male in the pinstriped suit and to get him off the bus. The EXPO officer went to the front door of the bus and got on to see if he could free the male from inside. I clambered on to the side of the bus, which had been blown outwards and was leaning at a 45-degree angle against the bus. "I tried again to shout to the male but got no reply. The EXPO officer returned from the inside of the bus and said, 'He's fading, we're going to lose him if we don't get him out'. He then climbed up on to the bus and started to try to rouse the trapped male. At this point, an inspector asked me why the engine of the bus was still running and if there were any secondary devices on scene. He also asked me if EXPO had searched the vehicle. I then asked the EXPO officer to confirm who he was and then I said to the inspector, 'The officer here is EXPO and he says there are no secondary as far as he knows'. "There were screams of pain from some of the injured in that courtyard. Also, some of those carried into the courtyard had died at this point. I then began to take some details of the injured and the helpers in the area but, before long, we had to move all the surviving casualties into the back of the courtyard, as a controlled explosion was about to take place. Once this had been done, I heard a loud explosion. "After this, we again moved the wounded into a conference room in the main building of the BMA. Once we had done this, I resumed the taking of names of as many people as I could, 42 names in all, mostly doctors on scene or civilian volunteers and witnesses of the explosion. Nor do we know 'how many explosions had taken place', even after 3 weeks of evidence. If it was one controlled explosion on the lower deck, the microwave, and one on the upper deck, the briefcase, how did this affect the victims who remained in situ at the time, and the evidence that was subsequently subjected to forensics analysis? Even if only one explosion had taken place, its effects on the immediate environment and on any evidence collected need to be examined. If two or more "controlled explosions" occurred, then the pressing need to examine the effects of such actions increases further. 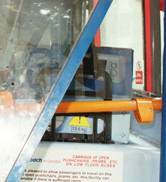 The expensive MOD modelling of the blast sites did not include modelling of the bus incident. Was this as a result of controlled explosions, and/or the fact that survivors who were extremely close to the blast did not suffer 'blast lung' as had been described as the cause of death of many of the tube victims? Q. 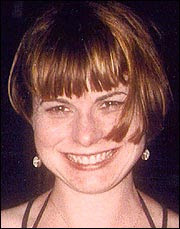 There was no complex modelling for Ms Hartley or, indeed, for any of the deceased victims from the bus bomb? A. [Colonel Mahoney] No, there isn't. The difficulty we were faced with with the bus bomb is that Porton felt it was modelling they could do, but it would have taken a long time. In fact, it would have taken them well into February. The difficulty being is for them trying to work out at what point the bus broke up, because when the structure breaks up, a lot of the explosive products are vented, which is why you have people with amazing stories of survival from the bus, because it was vented and they were not subject to the blast effects. Perhaps no modelling was done because computer modelling requires a foundation of modelling data upon which to base its model and the unique, never before seen, nature of the alleged explosives apparently used on 7/7 meant there was no data available from which to create those models? This fundamental lack of empirical data for what were at the time unknown explosives would also apply with regard to the computer modelling of the incidents underground. Further, determining the nature of the data on which any models were built might be an interesting exercise. 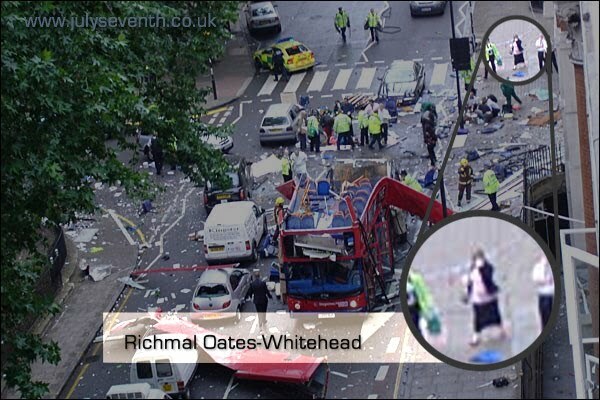 As for Richmal, she deserves respect for the assistance she provided on the day, assistance which, as shown in the testimony from her colleague and cited above, may well have helped save some of the lives that were saved. She, like the rest of us, also deserves the truth of the events on 7th July to be known. * The DPG officers in this photo from the morning of 7 July 2005 were likely attending the scene to usher out government ministers from a boardroom on the first floor of Lynton House, where a meeting was taking place in respect of security issues following London's successful Olympics bid. J7 received this information from a source who was placed on a gagging order by her employer and was subjected to over 36 hours of interviews by counter-terrorism officers. Lynton House has not been mentioned during the many hours of witness testimony in relation to Tavistock Square despite it being used extensively on the day of 7/7.